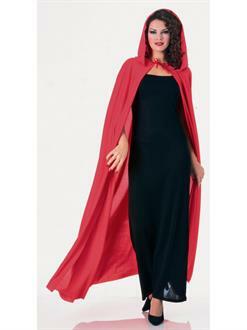 They won’t be sure whether to be scared or keep looking with our stylish Full Length Red Hooded Cape. This exceptional cape design is perfect for elegant but still scary costumes with that elegant touch! Become a powerful vampire or a stylish Victorian with this iconic and instantly recognizable design that’ll put these amazing touches on your costume! Make sure to descend the staircase slowly so everyone can get a look at this incredible design. Our Full Length Red Hooded Cape is perfect for vampire and evil mistress alike!